Ok... still 10 minutes to go before I go "offline" ! I'm getting palpitations just thinking about it!! The result was that I got home a little later than anticipated. Ok, I got home a lot later than anticipated... and, true to form, I hadn't finished making the placards for the demo (well, I had bought the materials...) I also hadn't had anything to eat, as, by the time Tenebrae finished, the pub had stopped serving food. Everything went well. I arrived in plenty of time, and without too many delays (though I am seriously considering whether I should drive in next year) and I even managed to find a convenient parking space. 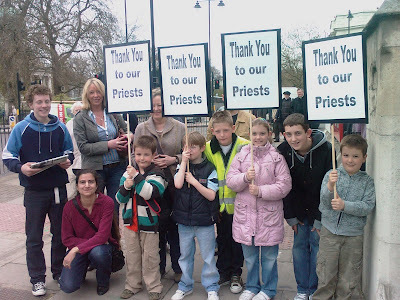 The first volunteers arrived, and we got ourselves organised so that the priests would get a good view of the placards (and us!) as they processed in. 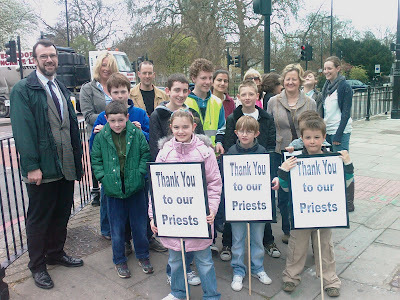 The cards appeared to be very well received, and I think that the priests were heartened by the round of applause they received from the youngsters. I was caught up in traffic which was heavier than usual because of various roadworks going on (due either to the start or end of the financial year, no doubt!) 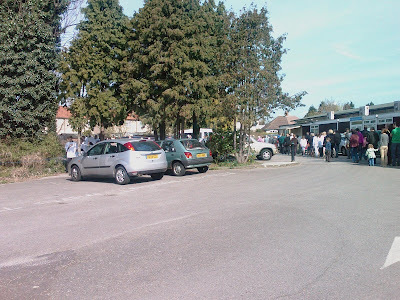 and, after lurking near a likely parking space and then snaffling it through some very nifty manoeuvring (sorry, unlucky 4x4 driver, but my need was really greater than yours!) I managed to squeak into the church in time for the start. 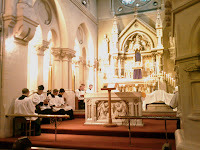 Tenebrae, the Office of Matins and Lauds for the Triduum, is pretty amazing. If you ever get the chance to attend, I would really recommend it... the singers at Corpus Christi had a mixture of plainchant and polyphony, which was awesome... definitely goosebumps time. One wonders what Tony hoped to gain by his oh-so-public conversion. Before his "conversion" he had a pretty lousy voting record on abortion, civil partnerships, the Sexual Orientation Regulations, homosexuality... and Cherie has pretty much blown the gaff (in her autobiography) as to the Blairs' views on contraception. Since his conversion, he has failed to repudiate his previous views on abortion, civil partnerships, the Sexual Orientation Regulations, homosexuality... and has been pretty outspoken on these matters, even going so far as to tell the Pope he has to get-with-the-times. Now, as I recall, all converts have to swear, before God, that they believe and profess all that the Church proclaims to be true. 1) Tony Blair was so woefully catechised before his reception into the Church that he truly didn't know the Church's teaching on abortion, contraception, homosexuality, euthanasia, etc. etc. If that is true (and, let's face it, catechesis post Vatican II has left much to be desired!) then those responsible for his instruction in the Faith are going to have some serious explaining to do come Judgement Day. 2) Tony Blair lied when he was received into the Church. He spoke the words, but didn't believe them, and didn't intend to live his life by them. I was under the impression that this was what is commonly known as sacrilege. 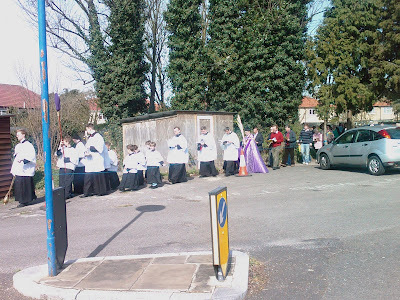 I might allow myself a brief post to explain how the Chrism Mass demo went. If any priest readers would like a card, leave a comment in the combox with a contact address (I won't publish them) and I'll send them out after Easter - I'm sure I'll have a few spares! Hilary White reports on LifeSite News that a little baby named Faith Hope is defying all the odds (and doctors' predictions) and is thriving six weeks after being born with anencephaly. Myah, a single mother and student living in Moncton, New Brunswick, writes that when she was 19 weeks pregnant, doctors told her that the child suffered from anencephaly, that she had not developed a large part of her brain. Myah was told that the baby could not survive outside the womb and was alive only because "she was attached" to her mother. 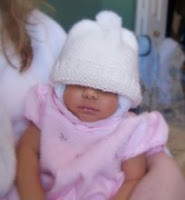 She was assured that Faith would be able neither to hear nor see. But contrary to doctors' predictions, and the received wisdom of most medical authorities on anencephaly, her mother reports that Faith is thriving and growing normally for a child her age. Apologies for the lack of posts... mind you, no-one seems to have noticed my absence! I experienced Palm Sunday in the usus antiquior for the first time, and was totally blown away by it! 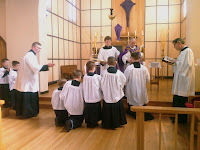 Even the distribution of the palm leaves had a deep solemnity, with everyone approaching the altar rails to be given their palm, rather than the Novus Ordo "grab your own." 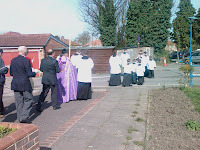 The procession was blessed with good weather... 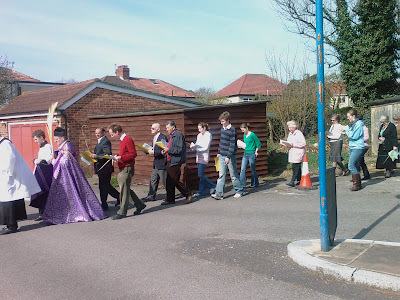 I confess to cheating a little: my ankle has been playing up, but I didn't want to miss the procession, and so I walked out with everyone else but found a convenient place to stop and take photos... 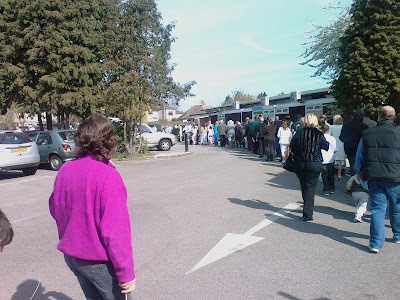 I think quite a few parishioners have become used to me whipping out my phone camera at the slightest provocation! 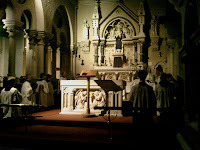 Dr. Lawrence Hemming visited us again, and Andrew Bosi, who regularly comes to sing at the Saturday Missa Cantatas, also made a special trip, so we had the Passion chanted. I don't know the names of the three "voices" (no doubt someone can enlighten me in the com-box) but the different tones used were wonderful, while the final tone used to chant the last part of the Gospel narrative gave me goosebumps. 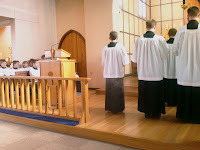 Our choir were in excellent voice as well... they sang the first Introit in a polyphonic setting (I think that's the right term) and it was really awesome.